Consequentialism and Catholic ethics seem to be natural enemies. The Catholic prohibition against intentionally killing the innocent, lying, committing adultery, and so on contradicts the very essence of consequentialism that no act may be assessed as good or evil independently of its consequences. However in the 1960s within the Catholic tradition itself, there arose a method in ethics called proportionalism which practically, if not theoretically, affirmed that which consequentialists have long affirmed and Catholic ethicists had so long denied, namely one may do evil that good may come. According to proportionalists, so long as the good effects are proportioned to the bad effects of the act, the act is licit even if evil is used as a means to achieve the good. In this book, Christopher Kaczor argues against the plausibility of proportionalism and its first proponents, namely Peter Knauer, Joseph Fuchs, Bruno Schuller, Louis Janssens, and Richard McCormick. Examining the genealogy of the movement, he disputes a received history that depicts proportionalism as a recovery of Thomas Aquinas. Instead, contends Kaczor, proportionalism is best seen as the organic successor to the moral manuals of the pre-Vatican II era. Proportionalism arises not from Thomas but rather extends many of the tendencies and presuppositions of the manuals. In particular, it retains their marginalizing of the account of human action as a knowing-willing involving a number of stages not always consciously recognized yet carefully described by Thomas in Summa theologiae, Prima Secundae , 6-17. Kaczor shows that a great deal of the plausibility of proportionalism rests on a fragile foundation that is rapidly eroding, an education in the moral manuals. Proportionalism and the Natural Law Tradition by Christopher Kaczor was published by The Catholic University of America Press in November 2010. 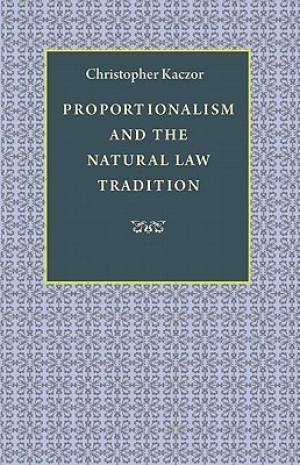 The ISBN for Proportionalism and the Natural Law Tradition is 9780813218670. Be the first to review Proportionalism and the Natural Law Tradition! Got a question? No problem! Just click here to ask us about Proportionalism and the Natural Law Tradition.